Product prices and availability are accurate as of 2019-04-18 21:25:28 UTC and are subject to change. Any price and availability information displayed on http://www.amazon.com/ at the time of purchase will apply to the purchase of this product. What role does communication play in the success or failure of a Network operations center project? What will drive Network operations center change? Have all basic functions of Network operations center been defined? Are accountability and ownership for Network operations center clearly defined? What are the revised rough estimates of the financial savings/opportunity for Network operations center improvements? This Self-Assessment empowers people to do just that - whether their title is entrepreneur, manager, consultant, (Vice-)President, CxO etc... - they are the people who rule the future. They are the person who asks the right questions to make Network operations center investments work better. 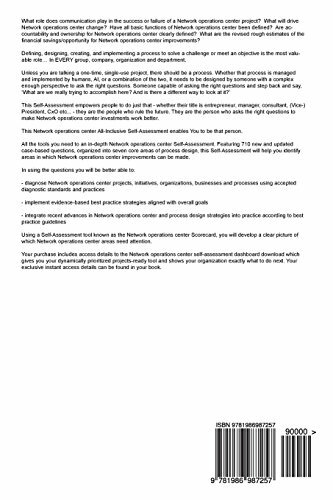 This Network operations center All-Inclusive Self-Assessment enables You to be that person. 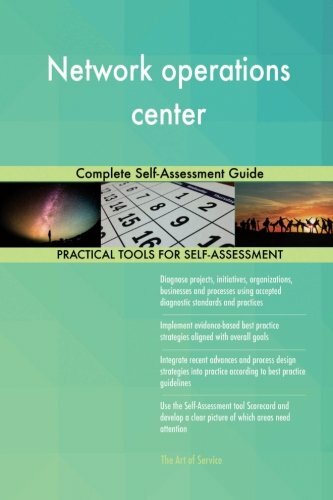 All the tools you need to an in-depth Network operations center Self-Assessment. Featuring 710 new and updated case-based questions, organized into seven core areas of process design, this Self-Assessment will help you identify areas in which Network operations center improvements can be made. Using a Self-Assessment tool known as the Network operations center Scorecard, you will develop a clear picture of which Network operations center areas need attention. Your purchase includes access details to the Network operations center self-assessment dashboard download which gives you your dynamically prioritized projects-ready tool and shows your organization exactly what to do next. Your exclusive instant access details can be found in your book.